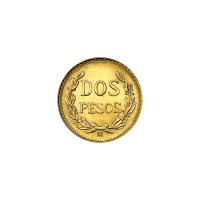 Pièce d'or 2 pesos mexicains d'année aléatoire Stack your gold with ease when you purchase a random Year Mexican 2 Pesos Gold Coin from our online store today. Similar to our Random Year Mexican 2.5 Pesos Gold Coin this 2 pesos coin series ran from 1918 - 1948 with the majority of the coins being issued with a year stamp of 1945. The obverse side has the "Dos Pesos" stamp framed within a wreath and crowned with the year of issue. Displayed on the reverse side is the Mexican coat of arms. With 90% purity this coin boasts an actual gold weight of 0.0482 oz of gold. Have your piece of Mexico's rich bullion history and diversify your holdings when you purchase a Random Year Mexican 2 Pesos Gold coin.